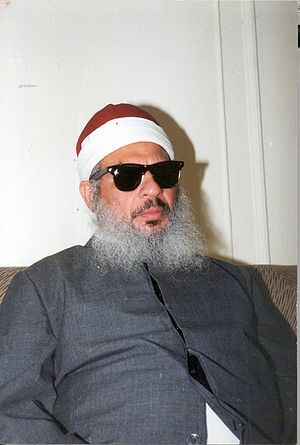 One of the interesting subplots to the Egyptian revolution is the fate of Omar Abdel Rahman, known as the Blind Sheikh, who is incarcerated in America for his role in organizing the 1993 attempt to blow up the World Trade Center. His family has maintained a small sit-in protest outside the US Embassy in Cairo since August, convinced of his innocence. They believe he was framed due to pressure from Mubarak to silence him over his harsh criticism of the regime. In recent days this undercurrent has intersected with a major crisis in Egyptian-US relations. The Egyptian judiciary has placed 43 NGO personnel under investigation, including 19 Americans, some of whom have been issued a travel ban. It concerns the post-revolutionary work of these NGOs, which are alleged to have instigated the protests and street fighting in and around Tahrir Square. The rumors run even deeper. It is alleged the offices of the International Republican Institute and the National Democratic Institute possessed maps of Egypt identifying the location of churches, so as to spark sectarian tension. Other maps pictured Egypt divided into four small states. One would be specifically for Copts, another for Nubians, and a third under Israeli administration. On Saturday, February 18, the family of Omar Abdel Rahman hosted a rally and press conference outside the embassy at the site of the sit-in. While only around two hundred people attended, speakers included several prominent Islamist and revolutionary figures. The session was entitled: Americans have sent their agents, so where is parliament in terms of its scholars? Demanding parliament interfere for the return of the Azhar scholar (Omar Abdel Rahman). Islamist lawyer Muntasir al-Zayyat achieved fame by defending many Islamists against the accusations of the Mubarak government during the years of his crackdown against them. He accused the US of violating its own laws in the detention of Omar Abdel Rahman, and led the call to parliament to sponsor the cause and pressure the military council to demand the US return him to Egypt. He wondered aloud why there were so few people in attendance, while a Salafi scholar detained in Egypt recently mobilized 70,000 people on his behalf. 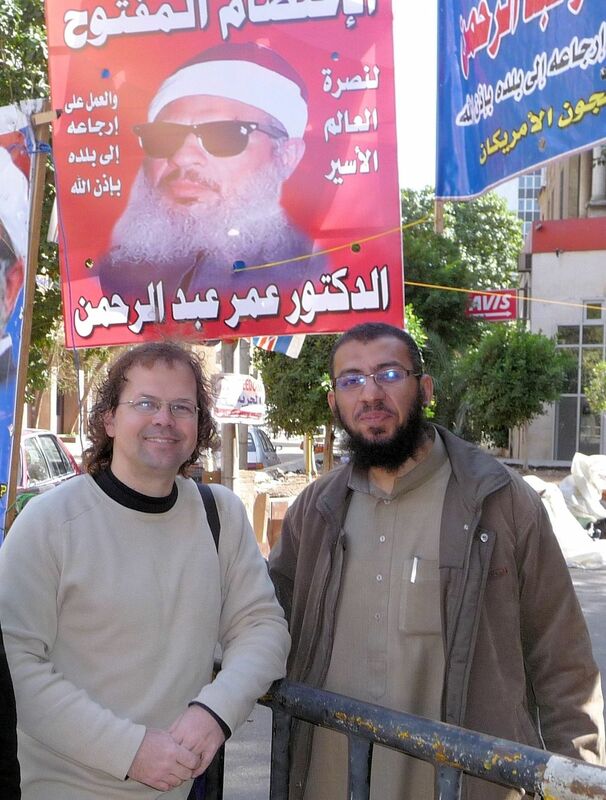 Mamdouh Ismail is the vice president for the Salafi Asala Party. During an early session of parliament he interrupted proceedings and issued the call to prayer. The Muslim Brotherhood speaker of parliament silenced him and told him to pray in the outside mosque. Ismail noted that it was Omar Abdel Rahman who taught Egypt the ways of revolution and opposing oppression during his long struggle against Mubarak’s regime. He harshly criticized the Muslim Brotherhood and the Salafi Nour Party, as well as the Building and Development Party of the Blind Sheikh’s own al-Jama’a al-Islamiyya, for failing to champion his cause. He believed liberals would not oppose the initiative, blaming Islamists for letting him languish in a foreign prison. Magdy Ahmed Hussein is a leader in the Islamist-leaning Labor Party, and leveled vitriolic criticism against America. He state the United States, like all tyrants, will not submit to any ‘request’ but only to the response of power. He thundered that Egypt could do without US aid, and floated the idea of attacking Israel. He accused Islamists of being weak, catering to the United States and failing to impose sharia law. Interestingly, Hussein’s bravado faded as he addressed Egyptian action. We should send from this rally a delegation to parliament – today, but tomorrow would be fine. We should ask them to consider our request, but be sure not to put too much pressure on them since they have a busy agenda. We should also take care not to have a big rally or march, as there is enough of that in Egypt already. The next speaker was Hany Hanna, known popularly as the Preacher of the Revolution, for leading Christian prayers from the stage in Tahrir Square. He counseled that all Egyptians must be treated without distinction, whether they are Muslim or Christian. He warned that many divide between these citizens – between Islamists and Copts, and even against ‘foreign Copts’. Furthermore, he stated that the government is now going after liberal NGOs in Egypt in the same manner it previously restricted Islamic organizations, and called for the sympathy of those present. In addition, he chided the conference for consistently calling for the release of the ‘Muslim’ or the ‘scholar’, but not for the release of the ‘Egyptian’. Our hope is in God for the release of Omar Abdel Rahman, he declared, but we must be a state of rights to pursue his cause justly. To note, a son of the Blind Sheikh told me Hanna has been present at every rally for his father since the sit-in began. Tarek al-Zumor is a leading member of the Building and Development Party of al-Jama’a al-Islamiyya, and is the brother of Abbud al-Zumor who led planning for the assassination of Sadat. He praised the revolution as one of the youth, which included Islamists, liberals, socialists, and all manner of Egyptians. He reminded, then, that though Abdel Rahman is now old, he has pursued an anti-Mubarak revolution since the days of his youth. He urged effort to be made to free the Blind Sheikh despite US pressure and aid, believing America to be dedicated to extinguishing the fires of the Arab revolutions. The highlighted speaker, however, was no less a luminary than Hazem Salah Abu Ismail, the Salafi candidate for president of Muslim Brotherhood heritage. He spoke with a calm and dignified demeanor in contrast to the bombast of many others. He drew a parallel between the case of Omar Abdel Rahman and that of the US NGO personnel in Egypt. Both are judicial matters independent of politics – or – both are issues of national security. Either way, they should be treated the same and Egypt should not bow to US pressure. In terms of the judicial angle, Abu Ismail criticized the Egyptian government in the case of the alleged US-Israeli spy Ilan Grapel. Charges of espionage were brought against him by the court, but he was later surrendered as part of a prisoner exchange with Israel. The trouble is that the judicial process was not completed, even if only in issuance of an official pardon. The Americans accused in the current NGO dispute must go through the full examination of Egyptian law. The United States, however, is looking to expedite this process through extra-judicial pressure and threats of withdrawing US aid. He believes the US wishes to solve this crisis during the transitional period of military government. The Egyptian government – and parliament – has been lax in terms of its pressure on behalf of Omar Abdel Rahman. For them it has been a matter of patience – ‘we have many matters to attend to in the revolution, perhaps just a week or so more’. He believes it is shameful his family has been forced to endure this. Rather, US pressure must be met by Egyptian pressure, or else the situation will calm and everyone will forget about the Blind Sheikh again. If this threatens to cost Egypt the substantial US aid package, let us call their bluff. He imagines the US is too cowardly to actually withdraw its money. Why? In reality, he says, it is not ‘aid’ at all. Most of the money is delivered directly to the military establishment and used to purchase US weapons – a American government subsidy, in essence, to the arms industry. The small percentage of money spent on civil society, meanwhile, largely pays the salary of US citizens who run US linked NGO programs. The United States, furthermore, should not be understood as a ‘righteous’ nation with which to deal. It uses its ‘aid’ to pressure every nation of the region – save Turkey and Iran – into supporting Israel, while paying lip service to principles of democracy, freedom, and rule of law. Then the US turns back home and exports its political prison to Guantanamo so that it can escape its own principles of freedom and rule of law. This is the context in which the struggle to free Omar Abdel Rahman must be waged. Parliament, parliament, where is Omar Abdel Rahman? Oh military, where is the Azhar scholar? Why does America oppress the free? Jailing Abdel Rahman is sinful. As for the case of Omar Abdel Rahman itself, this requires more investigation. It is noteworthy, however, that his family claims Mubarak pressured the US administration to jail him out of fear the United States would make of him an Ayatollah Khomeini and return him as a champion to Egypt, as France had done earlier to Iran. Rumors and rumblings in Egypt suggest a possible solution to the NGO crisis may amount to a trade of the Blind Sheikh for the detained American NGO personnel. The upcoming trial, if the legal system runs its course, anticipates these Americans held in a courtroom cage, as per Egyptian custom. It is an image that will resonate deeply with the American public, and even invoke memories, if not wildly inaccurate comparisons, to the Iranian hostage crisis. In an atmosphere of charged politics and conspiracy theories, the NGO crisis plays into fears of foreign interference. Among analysts who doubt these NGOs have done anything amiss, they bill the affair either as playacting to buttress the popularity of the military council, or else designed to move Egypt out of the US orbit, by hook or crook. Is something major brewing geopolitically at the Blind Sheikh sit-in outside the US Embassy in Cairo? Or are these the sincere, devoted efforts of a family to reunite with their father, against an American justice system that will never bend to pressure? Or, finally, is it a simple matter of justice for a man long – and perhaps wrongly – imprisoned? Revolutionary Egypt holds far more questions than answers. The case of the Blind Sheikh is far below even the local media radar, but bears monitoring all the same.